Minshew, L. & Anderson, J. (2015). Teacher Self-Efficacy in 1:1 iPad Integration in Middle School Science and Math Classrooms. 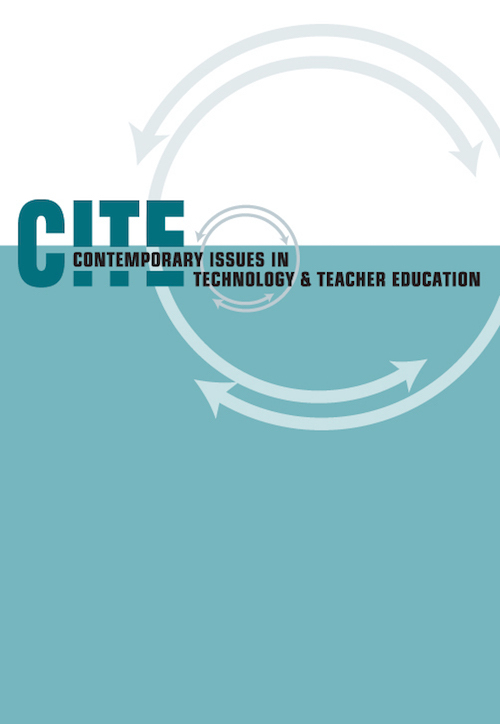 Contemporary Issues in Technology and Teacher Education, 15 (3), 334-367. Waynesville, NC USA: Society for Information Technology & Teacher Education. Retrieved April 24, 2019 from https://www.learntechlib.org/primary/p/147432/. Achieve (2013). Next generation science standards: For states by states. Washington DC: National Academies Press. Barab, S.A., Zuiker, S., Warren, S., Hickey, D., Ingram-Goble, A., Kwon, E-J., Kouper, I., & Herring, S.C. (2007). Situationally embodied curriculum: Relating formalisms and contexts. Science Education,91(5), 750-782. Bereiter, C., & Scardamalia, M. (1989). Intentional learning as a goal of instruction. In L.B. Resnick (Ed. ), Knowing, learning, and instruction: Essays in honor of Robert Glaser (pp.361-392). Hillsdale, NJ: Lawrence Erlbaum Associates. Fleischer, H. (2012). What is our current understanding of one-to-one computer projects: A systematic narrative research review. Educational Research Review, 7, 107-122. Greaves, T., Hayes, J., Wilson, L., Gielniak, M., & Peterson, R. (2012). Revolutionizing education through technology: The project RED roadmap for transformation. Eugene, OR: International Society for Technology in Education. Guzey, S.S., & Roehrig, G.H. (2009). Teaching science with technology: Case studies of science teachers’ development of technology, pedagogy, and content knowledge. Contemporary Issues in Technology and Teacher Education, 9(1), 25-45. Holden, H., & Rada, R. (2011). Understanding the influence of perceived usability and technology self-efficacy on teachers’ technology acceptance. Journal of Research on Technology in Education, 43(4), 343-367. Keengwe, J., Schnellert, G., & Mills, C. (2012). Laptop initiative: Impact on instructional technology integration and student learning. Educational and Information Technologies, 17(2), 137-146. Kumar, N., Rose, E.C., & D’Silva, J.L. (2008). Teachers’ readiness to use technology in the classroom: An empirical study. European Journal of Scientific Research, 21(4), 603616. Lincoln, Y.S., & Guba, E.G. (1985). Naturalist inquiry. Beverly Hills, CA: Sage. Matzen, N.J., & Edmunds, J.A. (2007). Technology as a catalyst for change: The role of professional development. Journal of Research on Technology in Education, 39(4), 417430. McCrory, R. (2008). Science, technology, and teaching: The topic-specific challenges of TPCK in science. In AACTE Committee on Innovation and Technology (Ed. ), Handbook of technological pedagogical content knowledge (TPCK) for educators (pp. 193206). Paraskeva, F., Bouta, H., & Papagianni, A. (2006). Individual characteristics and computer self-efficacy in secondary education teachers to integrate technology in educational practice. Computers and Education, 50(3), 1084-1091. Penuel, W.R. (2006). Implementation and effects of one-to-one computing initiatives: A research synthesis. Journal of Research on Technology in Education, 38(3), 329-348. Scardamalia, M., & Bereiter, C. (1994). Computer support for knowledge-building communities. The Journal of the Learning Sciences, 3, 265-283. Shulman, L. (1986). Those who understand: Knowledge growth in teaching. Educational Researcher, 15(1), 4-14. Swan, K., Holmes, A., Vargas, J.D., Jennings, S., Meier, E., & Rebenfeld, L. (2002). Situated professional development and technology integration: The CATIE mentoring program. Journal of Technology and Teacher Education, 10(2), 169-190. Teo, T. (2014). Unpacking teachers’ acceptance of technology: Tests of measurement invariance and latent mean differences. Computers& Education, 75, 127-135. Vannatta, R.A., & Fordham, N. (2004). Teacher dispositions as predictors of classroom technology use. Journal of Research on Technology in Education, 36(3), 253-271. Wozney, L., Venkatesh, V., & Abrami, P.C. (2006). Implementing computer technologies: Teachers’ perceptions and practice. Journal of Technology and Teacher Education, 14, 173-207.